Revisit the classic computer game. Take the leading role of a Pirate Captain in the 17th century Caribbean, amassing fortune and fame in an attempt to seize your rightful place as one of the most revered and feared pirates in history. 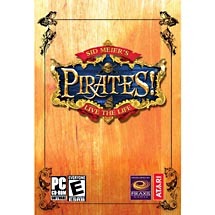 Test your skills as a sea captain exploring the high seas and exotic ports in a richly detailed 3D world. Overtake the enemy and seize valuable booty. Exchange plank-shattering broadsides in fierce naval battles and engage in duels with worthy opposing captains. Originally released in 1987, Pirates! received unprecedented critical acclaim for crossing multiple game genres to offer unique, unrivaled gameplay options. Now it's time for Sid Meier and Firaxis Games to bring this pioneering action-adventure game into the 21st century. An entirely new game engine will deliver updated gameplay, stunning new features, spectacular 3D graphics and enhanced sound effects so you can fully experience the intrigue, adventure and danger of life as a pirate on the Spanish Main.